The Knight Creative Communities Institute (KCCI) has launched a podcast series, “Think TLH,” featuring local innovators and creative thinkers who have made an impact locally, nationally and/or internationally. Visit www.kccitallahassee.com/thinkTLH or play the series on any podcast listening platforms, including Apple Podcasts, Spotify, Stitcher and Google Podcasts. “This podcast serves to showcase people in our community who inspire and spark change beyond Leon County,” Betsy Couch, KCCI Executive Director. After observing some of the diverse talent and impacts they were making locally and beyond, Alison Leavitt, KCCI Intern and Communications Coordinator and Florida State University senior, pitched the podcast idea to Betsy. 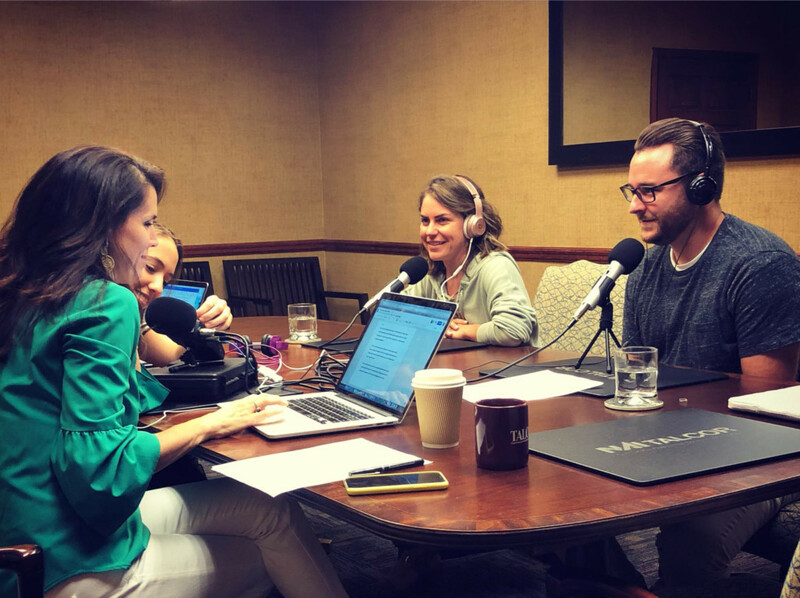 Every podcast episode shares how innovative ideas have made the Tallahassee community more successful and the catalysts behind them, with topics such as research, history, breweries and placemaking. It also highlights how quality of life and innovation serve as key drivers in retaining talent. Betsy Couch, serves as the host for the majority of the episodes as she interviews talented and creative guests in the community. Alison Leavitt is the editor and producer of the podcast, as well as guest host for some episodes. “Each guest on the podcast has a different story, but they all have one thing in common: their love for innovation and Tallahassee,” Alison Leavitt, KCCI Intern and Communications Coordinator. Three episodes are currently available for the series launch: Betsy Couch, Dr. Sara Hart and Jesse Taylor and Alex Workman. A new episode will be uploaded every Thursday morning. Betsy Couch (Executive Director, KCCI). What is placemaking and why is it important? KCCI Executive Director Betsy Couch answers this question by discussing how sense of place projects help retain, attract and harness talent, increase entrepreneurship and enhance Tallahassee’s economic mobility. Dr. Sara Hart (Associate Professor, Florida State University). Dr. Hart develops research utilized worldwide. Dr. Hart discusses her research on cognitive disabilities and how her findings can be used in classrooms and by parents. Alex Workman and Jesse Taylor (Founder/Storyteller, The Workmans and Graphic Designer, Marketing for Change). Hurricane Michael devastated the panhandle before hitting Tallahassee, Florida. Alex, his wife Chelsea and Jesse collaborated on a project to benefit coastal neighbors affected. Thank you to all of the first responders, linemen, police, firefighters and others who have helped the community recover. Dr. Tom Sawicki (University Ecology and Evolutionary Biology Assistant Professor, Florida Agricultural & Mechanical University). Recently, Dr. Sawicki and FAMU associate professor, environmental microbiologist, Richard Long made a groundbreaking discovery of a new underwater species. Althemese Barnes (Founding Director Emeritus and Operations Manager, John G Riley Center/Museum). Barnes is a pioneer in the Tallahassee community who has worked diligently to preserve African American history. She was a part of the founding team of the John G Riley Center/Museum, was instrumental in the creation of the Smokey Hollow Historic Site and the African American History Trail. Barnes’ work has been recognized at the local, national and state levels, inspiring others in the United States to do their part in preserving history. Alana Taylor and Ryan Sheplak (Project Manager/Designer, Architects Lewis + Whitlock). How do you design a space that will resonate to a wide-variety of international guests and folks of all background? Alana Taylor and Ryan Sheplak, Project Managers and Designers at Architects Lewis & Whitlock, use architecture to unite nature, culture and people. Byron Burroughs (Founder, Proof Brewing Company). The local Proof Brewing Co. has not only made an impact in the Tallahassee area but to the state of Florida, recently been named Best Beer in Florida and Best Brewery. Tune in to find out why the Burroughs, Proof’s founders, continue to call Tallahassee home as they embark on their next chapter. And many more guests are featured weekly. To listen to KCCI’s Think TLH podcast series visit www.kccitallahassee.com/thinkTLH. Have a suggestion for who should be featured in the podcast series? E-mail their name, contact information and why to KCCI at kccitlh@gmail.com.